It’s about the reader and only the reader. Use “you” in your text to give the reader ownership of your product or service, or the ideas you are putting forward. You are the center of the universe. That is because you are the reader right now. As long as you keep reading, you are the center of the universe. Everything in this article is about you, because if you stop reading, I would just be writing in an echo chamber. On your blog, “you” is also the center of the universe. But on your blog, you are not the “you”. You are just the writer; your readers are the all-important “you”. They want answers to a question. They want to solve a problem of theirs. They want to learn more about something. They want to decide whether to do business with you. As long as you keep reading, you are the center of the universe. Whatever reason they are reading your blog or website copy, it is for their benefit. They are not there to answer your questions or to solve your problems. So make your reader the center of the universe. 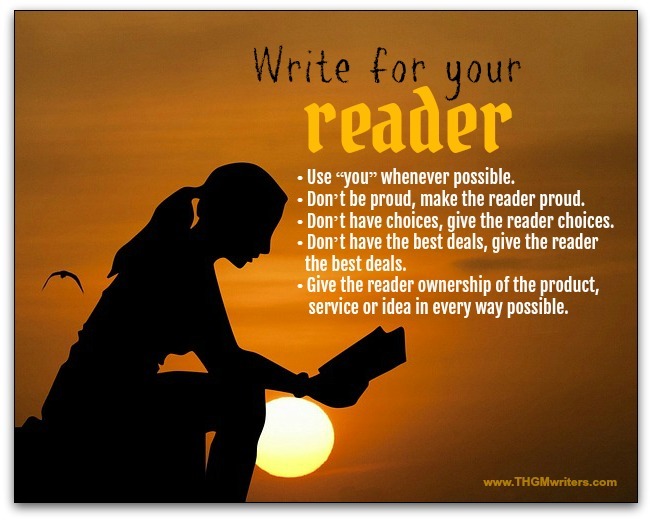 Address your reader as “you” whenever possible, and make your content about “you”, the reader. Yes, yes, I know this seems obvious. But I could bang my head against the wall for all the times I see companies make themselves the center of the universe. How can you make the reader the center of the universe? By turning these phrases around. So you’re proud of your amazing product? Go tell your mother. I’m sure she’ll care. Your customer doesn’t care about your pride. Sorry, I’m sure your pride is a lovely thing, but I have yet to hear of a customer searching for somebody with lovely pride. So how can you turn this one around? In two ways. First, by placing the reader in the center of the story. Refer to their pride. Not only do these approaches let the consumer feel the pride, but they hand possession of the product to the reader. All of a sudden, it’s not your product, it’s “your” product. Think about it. Are they more likely to buy your product (or your service or even your idea) if they are psychologically pre-disposed to thinking they already own it, like it’s already theirs, or if they feel like it belongs to somebody else? Make the reader psychologically pre-disposed to thinking they already own the product. Are you ever more important than “you”? Still, even here it sometimes pays to make “you” the center of the universe. The customer cares less about when you’ll ship than when the product will arrive. They care more about getting their money back if necessary than about your guarantee. But anything that sounds like a promise or a commitment, should be written in the first person. Make the reader believe that you stand behind your promise. If you are a little confused of when to use “you” and when to use “we”…and even more so on when to use “they”, check out this short video. It is a joint effort by THGM Writing Services and New Horizons. Have you read This Is Marketing by Seth Godin? He talks a lot about “you” (the customer). What a joy to be here again after a gap. I am so glad to read yet another information piece on writing. Yes, the “YOU” is more important in our writings. I never thought of its unwanted usage in many of our writings. You very well made it clear about its usage thru this post. Above all the video you created with Julie is another wonderful information. Indeed a well created one which speaks volume. Keep up the spirit of writing Dave. Yes, it is very timely and we the writers need to be more cautious about the usage of such words in our daily writings. Glad to Share it thru our social sites like Twitter and FB and G+ and few other curation sites, of course, will be making a note about his in one of my upcoming posts. Hey, Dave, Sad to note that G+ is going to end soon! so sad what is the next alternative for this Dave? As a blogger, I’ve touched it myself. Firstly, I was always writing for the sake of just writing new blog posts and getting more pieces of content on my blog. But later on, I’ve figured out that it’s not at all about the quantity but the quality of your blog posts and the overall writing tone.